How did Guy Hamilton's "Live and Let Die" win the Evening Standard British Film Awards in 1975? Most likely due to the soundtrack by George Martin. It wouldn't be fair to compare Live and Let Die's score with John Barry's masterworks in the Bond series, but it's impossible to deny the impact of this recording, as well as the strong relation with Barry's material itself. The title track was nominated for “Best Original Song” at the US Academy Awards in 1974, as well as receiving the title of “Best Album of Original Score Written for a Motion Picture” at the Grammy Awards. With Live and Let Die, Martin manages to capture that special Bond sound texture and give it a new lease of life with seedy jazz segments, much like Lalo Schifrin’s score for Dirty Harry in 1971, and South-American music, as well as a definite rock feel overall. Giving the locale of the eighth Bond picture, it’s only natural that the composer should opt for Latin-American and African rhythms, on top of many associated musical styles such as Salsa. The film had a love-hate relationship with audiences and critics alike, even considering the hugely dissatisfying Diamonds are Forever, released a couple of years before. However, George Martin’s score is the most energetic and diverse of all of them. 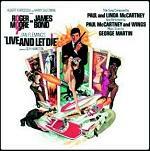 A Bond score wouldn’t be a Bond score without the mandatory introductory song, thus Paul and Linda McCartney provide us with the picture’s main title: “Live and Let Die”. The famous Bond theme can be heard throughout the soundtrack in it’s blaring and glorious form, in addition to the many variations based upon it, in tracks "Whisper Who Dares", "Snakes Alive", "Bond Drops in", "Solitaire Gets her Cards", "Bond to New York" and of course "James Bond Theme". In these tracks, George Martin has a great way of using clichéd material, sounding almost like an American TV-serial set in the 70's New York. The most interesting variation on the Bond theme appears in the track "Bond to New York", in which it is played alongside a high-speed militaristic drum pattern and distinctive 70’s flute and electric guitar, a nod to Isaac Hayes’ music from Shaft (Gordon Parks, 1971) in many ways. Other than the Bond Theme, “New Second Line” is the only instrumental track on Live and Let Die that wasn’t composed by George Martin. It’s a charming jazz ballad by trumpeter Milton Batiste, performed before his major breakthrough in the jazz industry in the early 80’s. "Gunbarrel/Snakepit" is another interesting track in which Martin opts for an African rhythm, sounding like it could have been performed on a darbouka drum; the same goes for "Sacrifice", performed in conjunction with fluttering wind sections this time around. The closest Martin comes to equating John Barry's mystique can be found in tracks such as "If he Finds it, Kill him", as well as in certain sections of "Bond Drops in". These two particular works are part of the best moments on Martin's soundtrack; they truly capture the romantic, the perilous, the suaveness, and the idealism of the Bond formula, with their soft percussion and breezy orchestration. This soundtrack is a must have for any Bond completist, and it also manages to please both the music connoisseur and the casual listener. The CD is available at these links: Amazon.com or Amazon.co.uk.